Strawberry Pina Colada Dessert is a quick and easy dessert that can be dressed up nicely. Though “getting fancy” can take it out of the quick category. There is a trick to making thick desserts look presentable in a clear glass container. Ideally, everything would go in without air bubbles and lay in beautiful layers with no blops, streaks or drips — but little in life seems to go the ideal way. 🙂 I do like these clear glasses for individual servings, though. They are just about the right size for one so they work great for portion control or for buffet serving. Dollar store, folks. So the price is right too. To keep it quick and easy, you can skip the individual servings. Make a light layer of strawberries and toasted coconut in an 8×8 pan, spread the dessert mixture evenly over them, and top with remaining strawberries and coconut before chilling. Cut into squares before serving. 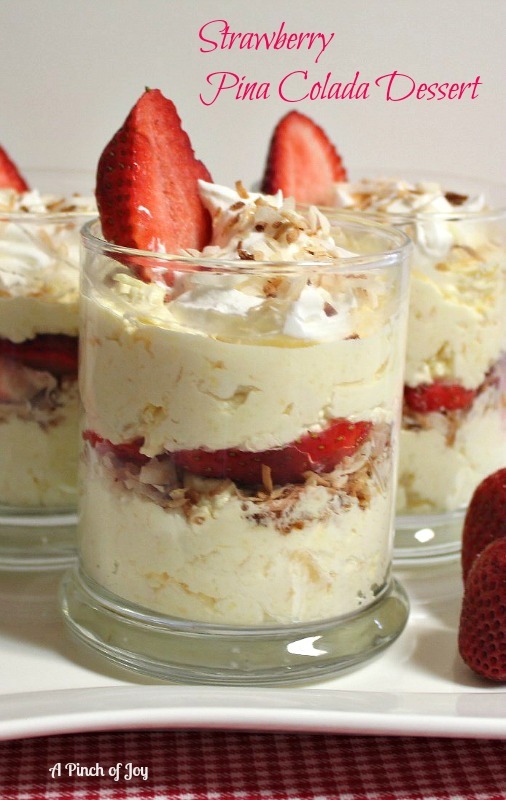 (Tip: when you’ve made the layer of strawberries and coconut on the bottom, run a finger or back of a spoon along the lines where you plan to cut the finished dessert. This will push the fruit toward the center of each planned piece, allowing you to cut and serve more cleanly). OR you can serve this in a graham cracker crust with all the strawberries and coconut on top. With graham cracker crust add 10-15 carbs per serving to the carb count. Toasting the coconut takes very little time, but adds quite a bit to this recipe. The flavor deepens and the toasty color is a nice contrast with the creamy colored dessert. I usually do extra and keep any leftovers in a small airtight container to add to other dishes. I like to use French vanilla or extra creamy whipped topping when they are available. Do not drain the pineapple – just open the can and dump it all into the mixing bowl. Don’t use the mixer to add the whipped topping as you risk beating the air out of it. Gently fold it in until the mixture is just blended. Keep the dessert light and fluffy, perfect for a spring day! A pretty, light dessert that combines pineapple and fresh strawberries with a hint of coconut. Makes a great dessert for a gathering where it can be served preportioned in slices or containers. Perfect for a mini dessert, too! Toast coconut by placing in ungreased skillet over medium flame. When coconut begins to show a bit of brown, reduce heat and stir frequently to keep it from burning. When most of the coconut flakes are golden, remove from heat. This takes 5 minutes or less. Soften cream cheese by letting set out for an hour at room temperature OR by removing foil wrapper and putting in microwave at 50% for 15 seconds and repeating until soft. Beat softened cream and cheese and milk with mixer until smooth and fluffy. Add dry pudding mix, vanilla and undrained pineapple. Mix well. Gently stir in the whipped topping, reserving about ½ cup for garnish. Layer dessert, strawberries and coconut and a second layer of dessert mixture. Cover and chill until firm, about three hours. Can chill overnight. Garnish with remaining whipped topping. Sprinkle on a bit of toasted coconut and add a few sliced strawberries to each serving. Six servings or 8-12 mini servings. I’m so glad you stopped by today! Follow A Pinch of Joy using the icons on the teal bar at the top of the page so you don’t miss a thing! I’d love to have your company on this venture!! Share: if you found this helpful or inspiring please click one of the buttons below! Your support of A Pinch of Joy is appreciated! What Shall I Make for Holiday Dinner? Wow! Looks fantastic! I really must try that.. Your recipe is awesome and thank you so much for sharing it at the table with Full Plate Thursday. Those look soooo yummy! I love them in the individual cups. Very pretty presentation. This looks wonderful, thanks for sharing at Marvelous Mondays. Wow, this looks so yummy! Can’t wait to try it.